The Lugarde Prima 5th Avenue 180 Summerhouse is a very smart looking corner summer house that has a very charming personality. It is a compact size so that along with its corner design means it will fit into even more smaller gardens. It has a very classy looking roof that has an overhang and is covered with shingles instead of felt to make it that much stronger and better at dealing with the weather. The door is a great feature as it is a good size and features a glazed window with a very impressive looking frame. 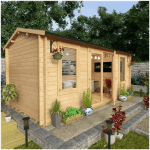 No matter if you need a place to relax, work, or just have fun, this summerhouse would be ideal. 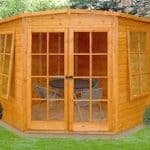 This summerhouse is designed so that it is very easy to put together. Lugarde have made sure that even a DIY novice will be able to put this together. The walls which are an incredible 28 mm thick just slot together and thanks to the clever use of aluminium on the inside make for one very robust corner summer house. If you want a summerhouse that is going to last many years then this one right here has been made to do just that. With thick roof and floor boards this summerhouse is well made from top to bottom. The Lugarde Prima 5th Avenue 180 Summerhouse is one very smart looking summerhouse that we feel as well as working great as a place to enjoy a few drinks and spend some time with friends and family, would work really well as a home office, playroom for the kids or even some kind of media room. We love the pentagonal design of this and it makes this summerhouse ideal if you want something that can go into a corner. Due to the shape it is a little hard to give the exact footprint of the summerhouse, but both the width and the depth of the summerhouse are listed at 5 feet 9 inches. This does not sound like a lot, but the shape of the structure gives you more space than you would think. Plus this more compact size makes it ideal if you do not have a lot of space. At its highest point the summerhouse is over 8 feet high, so there is plenty of headroom inside of here. The roof is just amazing. We love how many Lugarde summerhouses have this apex/conical kind of roof. 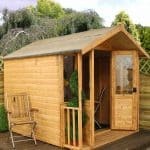 The roof is made with 19 mm thick roof boards which are much thicker than other summerhouses use. But the real kicker is what is on top of these. Rather than use roofing felt, shingles have been used and they really do give the summerhouse a more classy look. Also they along with the angle of the roof is going to make sure the rain always runs off it. Lugarde call their walls logs for some reason, but no matter what terminology they use they have gone for a tongue and groove shiplap style of cladding here for this corner summer house and we love it. The walls just look so smooth and the fact that they are 28 mm thick means that they are very strong as well. What Lugarde have going on inside this summerhouse is very interesting. 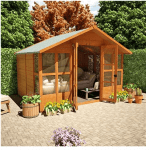 This line of summerhouse is designed so that the walls can easily slot together so that there is no need to screw a million screws or pound a thousand nails like with other summerhouses. This design means that a traditional frame is not required. Instead aluminium is used on the inside to provide extra support and help make this one incredible robust structure. We must say the way Lugarde design their summerhouses is very interesting and we are sure a few other manufacturers are going to steal this kind of design in the future. A strong floor with good joists is what they have used in here and they are proud to tell you that the floor is included. Which is a little weird if we are honest as at this price rage the floor better be included! Anyway the floor is more than strong enough to take a lot of weight and its tongue and groove style also looks great and goes very well with the rest of the structure. You are going to have to give the Lugarde Prima 5th Avenue 180 Summerhouse a coating of wood treatment shortly after construction. To be fair this is the case for most summerhouses that are on the market so we will not be harsh on it for that. A fresh coating of treatment should be applied on an annual basis. You remember to do this and the summerhouse will stay free from rot. 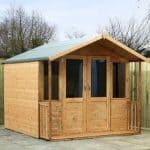 Lugarde give you a five year warranty with this corner summer house and that covers you against faults with the materials. It does not cover you against rot if you do not treat it properly or any human error like you dancing and putting your elbow through the window. We really like the door they have used on here. It is a single door, but a good sized single door so getting things like a table and chairs will be very easy. The door has a great design and the cladding is the same as on the rest of the summerhouse so it blends right in. There is a proper door handle with a lock which just finishes it off very nicely. The door has a glazed window on it and we really like the framing they have used. But this is the only window on the structure. This is very disappointing, especially at the price they are asking for it. We feel that there should have been at least two other windows on the side as it is going to be hard for natural light to get into the summerhouse. 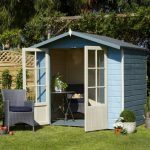 The Lugarde Prima 5th Avenue 180 Summerhouse is one very sturdy and secure corner summer house, as the door has a proper lock. When you are not using the summerhouse you are going to be able to lock it up and make sure that anything you have inside it is kept safe and sound. If you do not count the one of the door there are no windows on this. That means that it is very hard for someone to have a cheeky look and see what you have inside. So while we may not be too thrilled that there is a lack of windows, it does actually make this one of the more private summerhouses we have seen in quite some time. We were actually very surprised in the amount of customisation options that this corner summerhouse had. To start with you can choose what colour the shingles are. Black, red, blue, green and brown can be chosen at no extra cost. The decoration on the top of the roof can also be picked. A brass ball, chrome ball, weather witch and weather cockerel can be chosen. The door handle can either be brass or chrome to go with the roof decoration. This level of customisation is very impressive and it lets you play designer a little bit so it can be fun deciding what you want. The Lugarde Prima 5th Avenue 180 Summerhouse does have a couple of extras to tempt you with. For £390, you can get their installation service which may be handy if you are not too DIY savvy. They also can stain the wood for you if you want to jazz up the overall design. White stain, brown stain, green strain and blue grey stain can be chosen. Each of these is priced at £235. This is one very sturdy, well made and generally robust corner summer house. We are very impressed with good this is. They really have made sure this is a top quality summerhouse from top to bottom. The actual structure is very solid and made to last so as long as you look after the wood and protect it from rot. Then there is no reason why you should not get 20 or more years out of this. 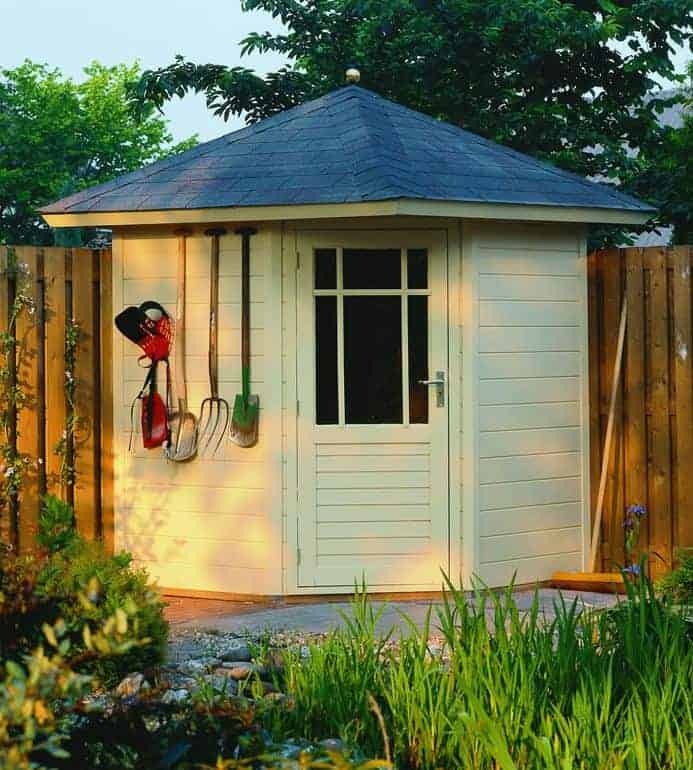 This is one of the smaller summerhouses we have seen so you will have to be quite crafty with how you organise your things inside it. Lugarde designed this summerhouse so that it is easy to put together. You will need a friend to help you out and the height of the roof may be the trickiest part, but this is not going to cause you too many issues. This is one very high quality summerhouse. It is made with top of the line materials and has an awesome look. But you are being asked to pay a premium price for this and with it being so compact, we are sure some of you may not be keen on paying the price they are asking. Final Thoughts: We really like the Lugarde Prima 5th Avenue 180 Summerhouse. They have really gone above and beyond to make sure only the best materials were used in designing this corner summerhouse. As a result the price is high, but to be fair it has to be as the materials really are top quality. Still this is one of the smaller summerhouses out there so if you need a lot of space then you will have to really think about how you lay your things out inside it. Still this compact size does make it ideal for those of you who have a garden that does not have a lot of spare space.